Dance classes are a lot like fashion. Over the years fitness and dance classes have changed. Learn about what's new, what's old, what's being recycled. Here is our list of Best Adult Dance Classes for 2018. Lets start with fitness Aerobics! If you were born between the 60's and 80's you know about Jane Fonda and Richard Simmons. Aerobics by definition means a system of physical conditioning that increases the efficiency of the body’s intake of oxygen, thereby stimulating the cardiovascular system, developing endurance, and reducing body fat. From an outsiders perspective fitness aerobics included neon or cheetah print leotards, big hair, a lot of jumping around sprinkled in with inspirational screaming. Dance programs like Reebok Step Up and Jazzercise dominated the 80's and 90's. Fitness clubs across the nation offered morning and night adult dance classes in the fitness aerobic category. Zumba started working its way through Chicago around 2012. Classes have less people then ever before. Is this because Zumba is dead? No it's because our market is saturated with certified instructors. You can find Zumba in almost every fitness chain across america, inside local dance studios and national chains. Zumba lives on. This class is a little more of a gentler approach to fitness. Be moved has more of a dance background focusing on movement and wellbeing. Be Moved uses a plethora of genres for inspiration from 80's to Soul Funk, Jazz, Theatrical, and more. This class uses the joy of dance and music and you get to burn some calories. Our most popular request continues to be Salsa dance classes. Beyond burning calories in dance class, adults can actually go out to a night club and dance. 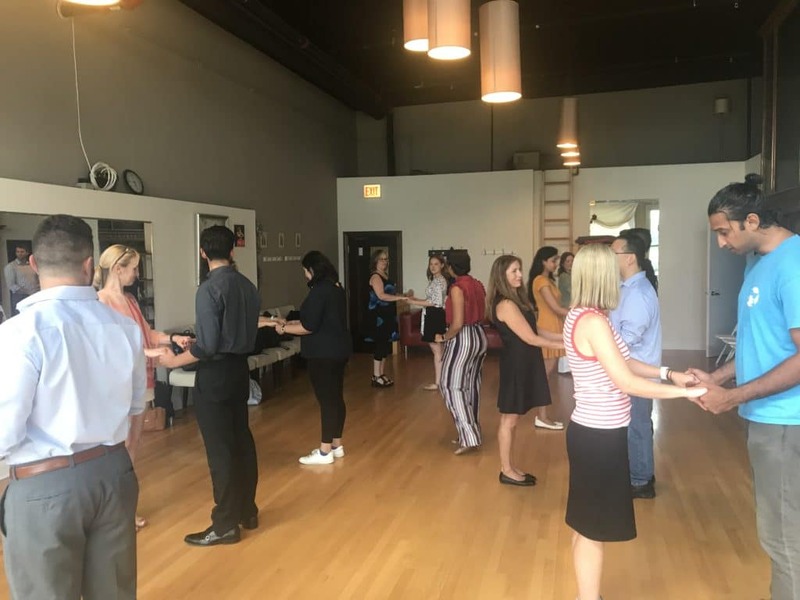 Outside the classroom there are many opportunities to dance salsa in the Chicago Market. Our salsa dance classes start at the beginner level and go up to the advanced level. We vote the Best Adult Dance Classes for 2018 is Beginner Salsa. First its our most requested class. Lastly its been our most popular class for 5 years. At Windy City Wedding Dance we offer beginner level ballroom adult dance classes as well as salsa. In addition we offer private dance instruction 7 days a week. We help educate adults about movement, posture, dance, and social dancing. It's normal to experience a variety of music genres being played in the back ground. Interested in taking a dance class? Whether its for a wedding or just for fun, we can customize any program for our clients. Despite the cold weather we always say its 70 and sunny in the dance studio.